Several months ago, professors Jeffrey Hall, Michael Rosbash and Michael Young received the Nobel Prize for their work on deciphering the mechanisms of the biological clock. Many other scientists around the world are also investigating this topic, including the group of researchers headed by Prof Ralf Stanewsky (a former trainee in Jeffrey Hall's lab) at the University of Münster, Germany. Although scientists have discovered a diverse array of basic mechanisms, many unanswered questions about chronobiology remain. 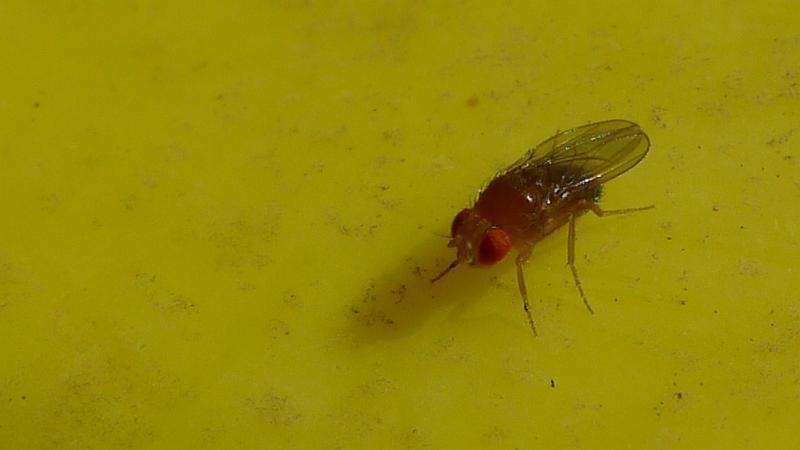 In two papers recently published in the journal Current Biology, a team of Münster biologists has now presented new findings on the inner workings of circadian clocks in the fruit fly (Drosophila melanogaster). The researchers have found evidence that indicates that light and temperature stimuli play a mutual role in their synchronisation. Furthermore, they also identified yet unobserved molecular pathways in the photoreceptors, which also affect the fruit fly's circadian rhythm. All animals, plants and single-celled organisms possess an internal circadian rhythm that regulates physiological and behavioural processes, for example, the sleep-wake cycle. The term 'circadian' refers to the length of this cycle, i.e. approximately one day, or about 24 hours. This is defined by so-called clock genes, specifically period and timeless genes. "Like a wristwatch, organisms have internal clocks that have to be set on a regular basis," explains Ralf Stanewsky. This means that all organisms adjust their internal clocks to external factors that are determined by the Earth's rotation, namely light and temperature cycles, which synchronises them to the natural day-night rhythm. While the light-dependent mechanisms of synchronisation are well understood, very little is known about how temperature influences the circadian clock, and how light and temperature stimuli are mutually processed in the brain. To this end, Ralf Stanewsky and his team investigated the role a specific gene called nocte plays in this process. Fruit flies with a non-functioning nocte gene are no longer able to synchronise their sleep rhythm based on the temperature of their environment. The abbreviation "nocte" stands for "no circadian temperature entrainment." The nocte mutants were, however, still able to use light input to synchronise their circadian clocks as long as the temperature around them remained constant. As soon as the light and temperature began to fluctuate simultaneously (which would normally occur at night when the temperature decreases), the circadian clock fell out of sync, which in turn disrupted the flies' sleeping rhythm. "We show that the nocte gene normally regulates the transmission of information on the environmental temperature to special 'clock neurons' in the brain. When this gene is missing, false temperature signals are sent to the clock neurons which then disrupts the fly's sleep pattern," says Ralf Stanewsky. The nocte gene provides the building plan for a protein which is found in the chordotonal organs of insects. These miniscule sensory organs are located directly beneath the skin and detect external mechanical stimuli such as vibrations. The new study indicates that the chordotonal organs might also play a role in the temperature-dependent regulation of the circadian clock. In the second study, the researchers focused on a phenomenon they had observed in their earlier studies but hadn't yet been able to explain. The observation was made in connection to the photoreceptor cryptochrome. Reactive to blue light and normally found in clock neurons in the brain, it plays a vital role in the synchronisation of the circadian clock. Interestingly, the circadian clocks of mutant flies which neither possessed cryptochrome nor a visual system, were able to adjust to the daily light-dark cycles, albeit at a much slower rate than healthy specimens. Researchers did not know how circadian synchronisation could function without cryptochrome and the visual system. In the new study, the researchers showed that some of the photopigments contained in the eyes of the flies contribute to synchronisation through a previously unknown molecular cascading reaction, specifically the pigments rhodopsin 1, 5 and 6. These three photopigments play a central role in visual processes. "We were surprised to find that they transmit light signals from the eyes to the clock neurons in the brain independent of their visual functions," reports Ralf Stanewsky. This effect had not been previously detected in earlier studies because researchers had focused on the conventional visual molecular signal cascades caused by light-induced reactions in the eye. The research team also demonstrated that the newly discovered molecular pathway was responsible for synchronising a whole group of specialised clock neurons. "These are different neurons than the ones responsible for temperature-dependent synchronisation," explains Ralf Stanewsky. "There appears to be a division of labour between the 150 clock neurons in Drosophila, whereby some neurons react more to light while others react more to temperature." In both studies, the researchers used mutant fruit flies with alterations made to genes that were central to the focus of investigation. Specifically, these comprised nocte (which researchers had already isolated in previous studies along with the corresponding mutants) and key genes responsible for light synchronisation. It was then tested, if the mutant insects were capable of synchronising their circadian clocks and sleep-wake behaviour to the external light and temperature cycles. For this purpose, the researchers used a so-called luciferase reporter assay and brain antibody staining—two methods which make rhythmic gene activity visible in the clock neurons. To measure the sleep-wake behaviour of the flies, the researchers applied a test which automatically measured how frequently the flies passed an infrared barrier to quantify their activity.